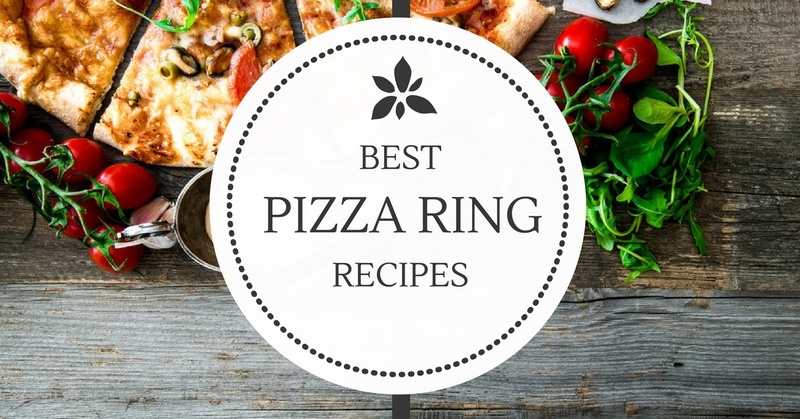 The pizza ring recipes are easier to prepare. You can add more ingredients or substitute some of them. For those who love ﻿pizza, this is the best type that you can prepare at home and enjoy. The pizza can be served on various occasions to entertain your visitors. 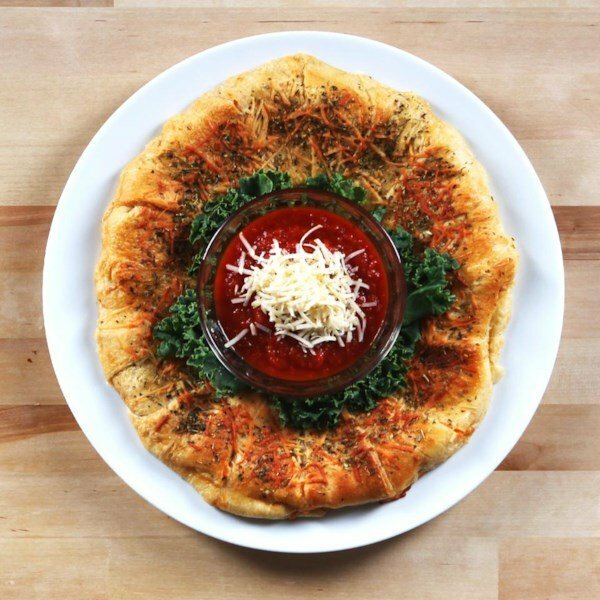 You can also serve the pizza ring for breakfast, dinner, as an appet﻿﻿﻿﻿ize﻿﻿﻿﻿﻿﻿r, or at any time of the day. 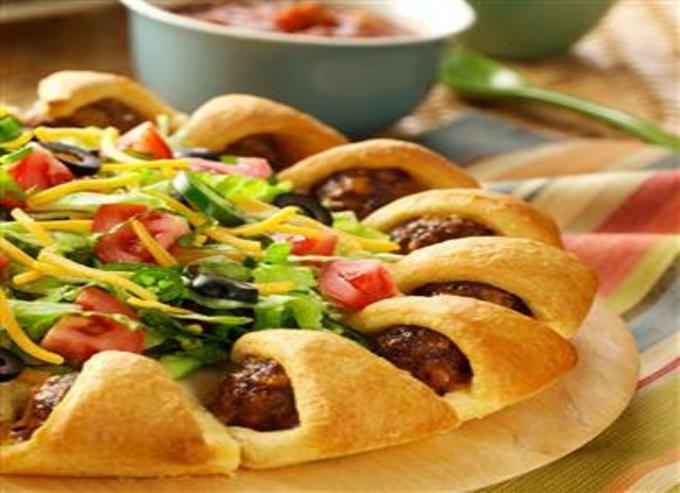 The following information will guide you step by step on how to prepare the pizza ring recipes. The following are some of the recipes that you can try at home. Cook the ﻿sausage in a skillet until the color is no longer pink. Drain the excess fluid and add half of the pizza sauce, the bacon, and a cup of cheese. Unroll the crescent dough. Separate the dough into triangles after unrolling it. Arrange the triangles on a pizza pan that is ungreased. The triangles should form a ring with the tips pointing out and the wide ends at the center. Ensure that there is an opening at the center. The overlapping dough can be pressed for sealing. Fill the wide ends of the triangles and fold them over the filling. Tuck the points in form of rings. Place it in the oven for about 15 minutes. Ensure that it is heated through and the color will turn golden brown. Sprinkle with the remaining cheese and bake for 5 more minutes.When ready, serve the pizza ring with the pizza sauce. This is the best snack that you can prepare the kids and the whole family. It is and simple to prepare. You can prepare this weekly for dinner. Preheat the oven to about 375 degrees F.
Mix the pepperoni, the cooked sausage, ¾ of the pizza sauce, and the cheese in a bowl. Take the dough out of the cans and unroll them. Make 8 rectangles from the dough and arrange them on a cookie shee﻿t. Arrange the rectangular pieces to form a ring at the center. It is normal for the dough to overlap. Put the filling on each piece using a spoon. The filling should be near the ring. Take the part that has no filling and place it over the filling. Tuck it under the bottom to make it secure. Repeat the procedure for all the pieces. Separate the perforations of the dough on the top to ensure that the filling peeks through. Spread some butter at the top of the dough with a brush then sprinkle the grated parmesan cheese. Place it in the preheated oven and bake for about 25 minutes. The dough should turn golden brown when ready. Cut you pizza ring into pieces for serving. If you feel like the pieces are not hot enough, you can microwave them for about 2 minutes. When hot, serve and enjoy. For the pizza lovers, this is the best pizza you can prepare at home. You can change the toppings to your taste. 2 tubes of Pillsbury crescent rolls, 8 ounces each. 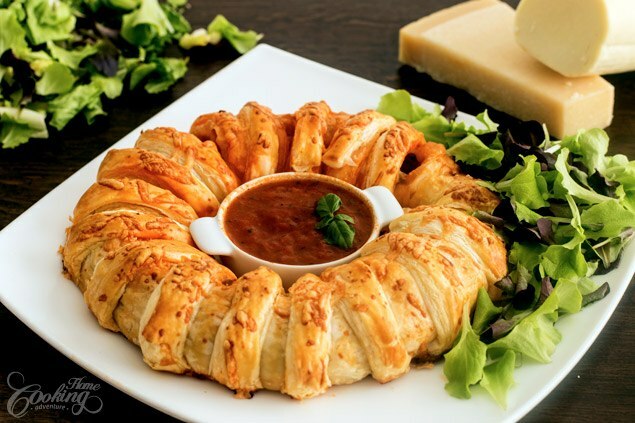 Before you start preparing the pizza, heat your oven to 375 degrees F.
On a pizza stone or baking sheet, spread the crescent rolls in strips of two. On top of the rolls, spread the pizza sauce and then spread the mozzarella cheese. Add the other toppings that you have on top of the c﻿﻿hee﻿﻿se. Fold the rolls over the edges to create a ring at the center. Sprinkle some garlic powder and other seasonings on top. Put the pizza in the oven to bake for about 15 minutes. It should turn golden brown when ready. ensure that the inside cooks well. Make this type of pizza at home to enjoy. You can stuff the pizza with peppers, basil, mozzarella, and pepperoni if you want. The pizza can be served with a creamy ranch dressing. Roll the pastry into 2 large rectangles. Slice the pieces into 16 triangles, 8 triangles from each piece. Arrange the pieces on a baking dish in a circle. Let them overlap each other slightly. This will ensure that the filling is wrapped well. Take some pizza sauce and spread around the ring formed. On top of the pizza sauce, add the cheese, basil, red pepper, and the oregano. All these will form a circle of ingredients. Fold the tips of the triangles towards the center to cover the fillings. Tuck the under the pastry for sealing.You can press them lightly. Use the whisked eggs to brush the ring that was formed.Drizzle the remaining sauce and then add the cheddar cheese that is grated. Place your pizza in the preheated oven and bake for about 25 minutes. The pizza should turn golden and rise well. The remaining topping and cheese can be poured over the ring. Return it to the oven and bake for 10 more minutes. Cut the ﻿pizza into pieces and serve with the ranch dressing. Roll out the crescent rolls. Put 2 rolls together to make 8 rectangles. Spray your baking sheet with the cooking spray. Place the rectangle pieces on the sheet to form a circle. The short ends should point inwards. This will create an open circle at the center. The short ends corners can overlap each other to prevent the filling from leaking. Spread the sauce on the entire ring near the center. On top of the sauce, sprinkle the oregano. Add all the cheeses and then the pepperoni. Fold the outer edges to the center. You can overlap everything to seal the ingredients. Sprinkle the remaining oregano on top and the parmesan cheese. Place it in the preheated oven and bake for 15 minutes. The crust should turn brown. 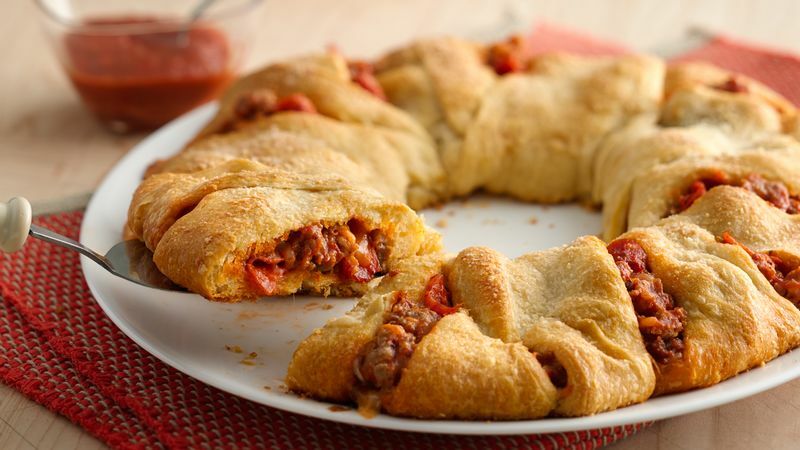 Slice your pizza ring into pieces and serve with the marinara sauce. Did you enjoy reading the recipes? 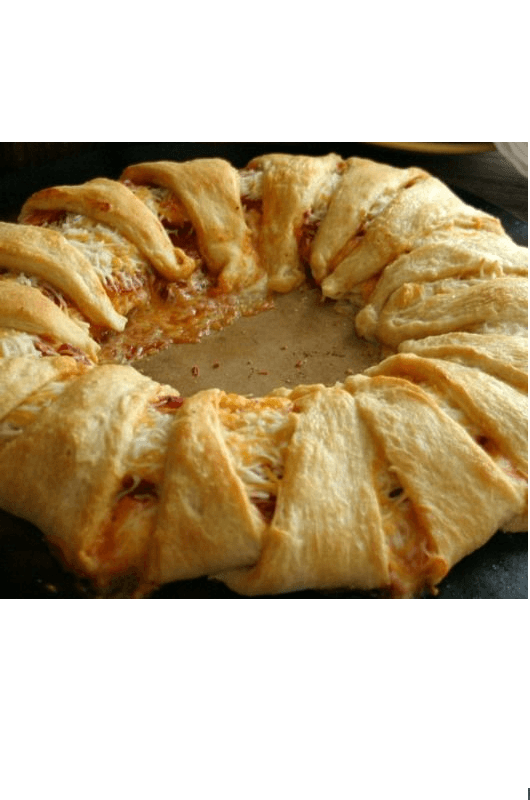 The above are some of the simple pizza ring recipes that you can prepare. You can add more ingredients if you like. Arrange the dough to form a ring at the center.When covering the ingredients, it is normal for some ingredients to remain uncovered. If you have a comment or question, feel free to share below in the comments section. You can also check a list of Bajan sweet bread recipes.